A gusset is a diamond shaped or triangular piece of fabric that you sew into a close fitting garment in order to ease the movement of the arm or other body part. All these VPO patterns feature a gusset. So if you like vintage patterns, especially those with a kimono sleeve, then at some point or another you are going to have to learn how to put one in. Traditional T shaped garments often had gussets at the underarm, shoulder or crotch, in order to shape garments that were made up from straight pieces of wool or linen. You may remember I wrote about my Viking Personal Assistant from Melbourne. She wears traditional men’s wear for fun. These survive today in traditional garments, such as the Romanian blouse. There are two types of gusset – one piece or two pieces. The one piece is a square or diamond shape; the two piece is two halves of the square/diamond ie two triangles that join. The two piece is easier to insert as it is joined to the garment, then joined. 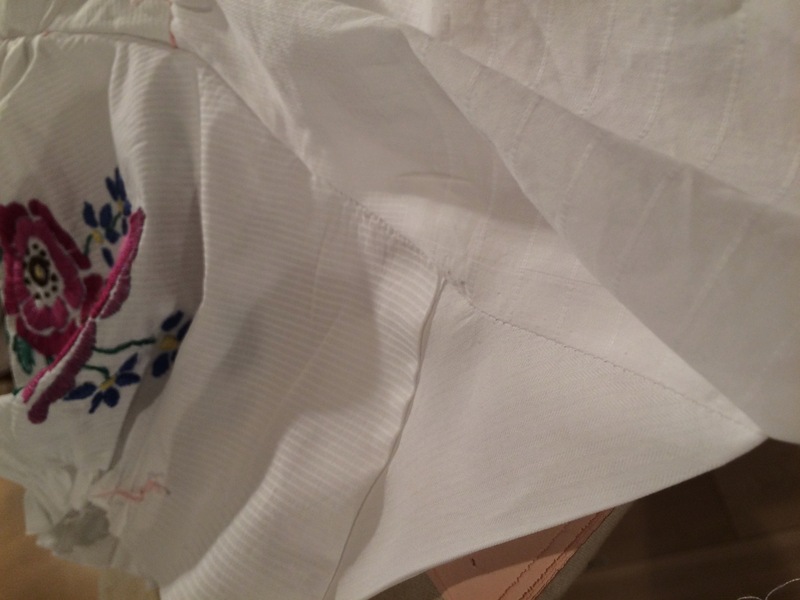 I will cover the one piece here, and describe putting it into my embroidered 1940s blouse. A different method involves slashing and reinforcing a kimono sleeve, which is probably the method used for the Vogue patterns above. If you are doing that kind of gusset further steps are involved. 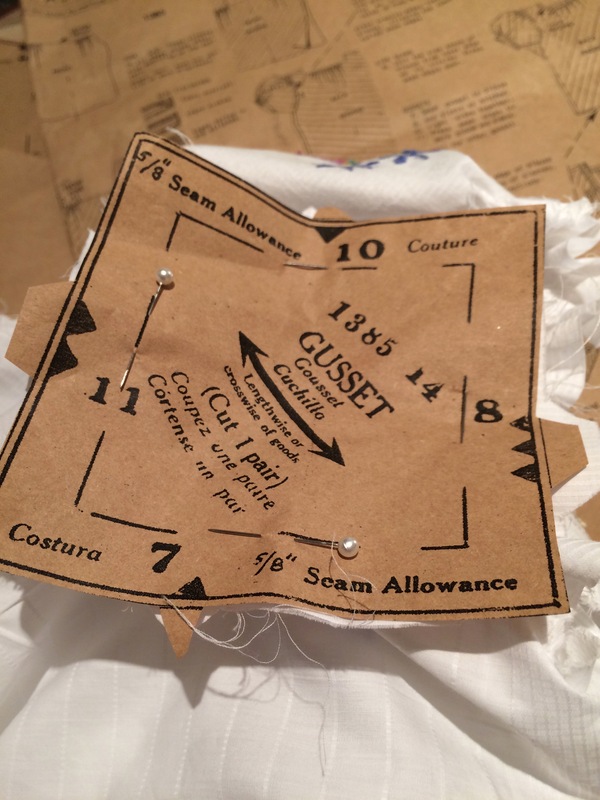 Pin the right side of your gusset to the right side of the garment opening, matching all the markings accurately. 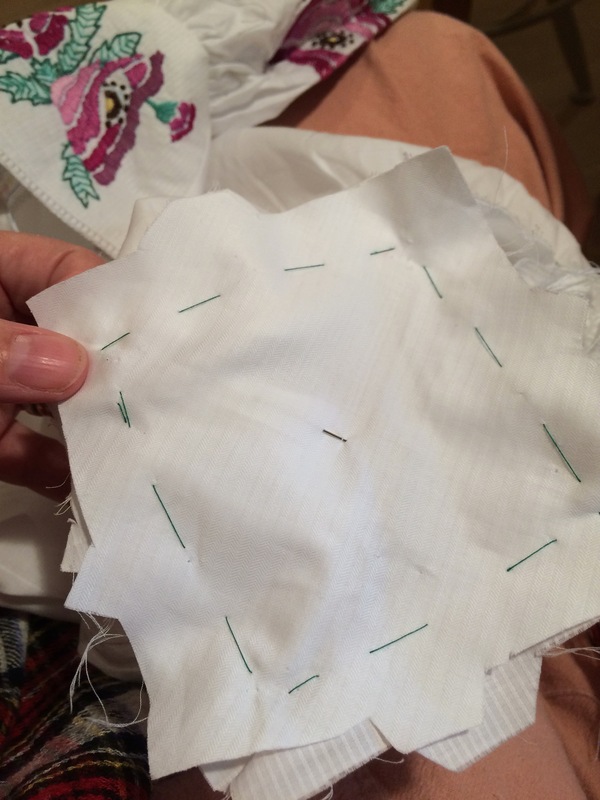 Baste the gusset into the space, making sure it is completely flat with no tucks, or stretching. Rebaste if necessary. With a small stitch (say 1.0) start stitching very slowly. After around 20 stitches increase the stitch to say 2.2. but shorten again when you get to the next corner. At the point pivot, taking one stitch across the point, and continue stitching to the third corner of your square, again shortening the stitch as you approach the point. Leave a long tail on your two threads. Repeat starting at the corner you finished on, stitching to the fourth corner of the square, and then back to the starting point, again shortening your stitches at the points. Again leave a long tail. Pull the thread ends to the wrong side of the gusset and knot them together. Press the seams towards the garment. Top stitch if desired. On the outside it looks like a neat triangle. Well, neatish. I will make a better job of it next time! Oh brilliant Jay. Thanks so much for the reference. I find it easier to sew gusset as four separate seams. If you pin the very start and end points they close neatly. It’s almost impossible to describe in words what I mean so I hope that makes some sense. Interesting and clear! I have worn garments with gussets, but have not imagined sewing them. 🙂 I will keep this for reference in case I one day do (and will retain Kim’s advice, too). Got to love a gusset! !